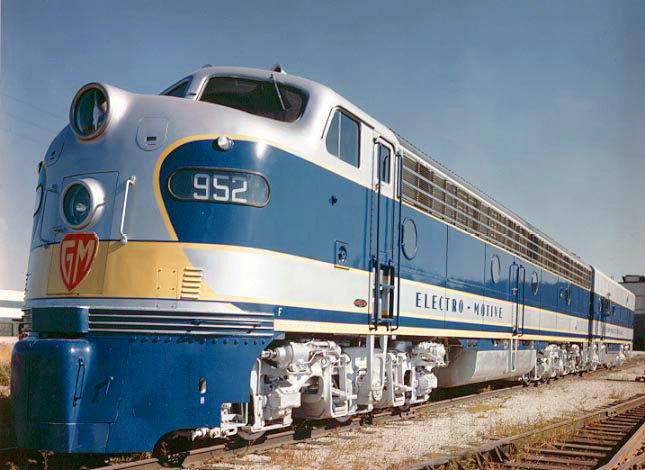 Along with its iconic FT series, the EMD E series (originally the design of the Electro-Motive Corporation before it became a division of General Motors) was developed primarily for passenger service and would become one of the principal diesel-electric models to spell the end for steam. The design was first developed in the 1930s as the EA, featuring a slant-nose and sweeping carbody. Quite attractive it caught the eye of the Baltimore & Ohio and Santa Fe, and then went on to be tested on several other roads. The E series went through a few carbody modifications before it was a decided that a more-standard, "Bulldog" nose design would be applied to all covered wagons EMD produced for both passenger and freight service. Ultimately, far fewer Es sold than their F series counterparts. However, they still proved to be the top-selling passenger design of the era. Today, several examples of Es are preserved and a handful remain operational. The Electro-Motive Corporation (EMC) had its beginnings in 1922 being based out of Cleveland, Ohio building inexpensive motorcars. With the purchase of the company in 1930 by General Motors, and more resources at its disposal the company began developing the precursor of the modern-day diesel-electric road unit (cabs and road-switchers), the streamlined trainset, which consisted of a powered car permanently attached to a few coaches (usually two or three cars). The most famous of these streamlined trainsets was the Burlington Zephyrs, a beautiful streamlined stainless steel creation (originally powered by Winton engines, which would also become a subsidiary of GM) that was extremely lightweight and fast. The original trainset, the Zephyr 9900, made headlines in 1934 when it completed a non-stop journey from Denver to Chicago in a little over 13 hours. Because the power cars with these trainsets were permanently attached to the coaches EMC sought to design a locomotive free of this articulated setup but designed in such a manner that a railroad could still attach it to any passenger train and obtain the same, smooth streamlined look. This it did with the unveiling of the EA model in 1937, the first in a long line of passenger diesel locomotive designs that would come to be known as the E series. The EMD (Electro-Motive Division) E series set the stage for the end of the steam locomotive era (perhaps the key difference between the EMD E series and F series was that Fs rode on B-B trucks whereas Es rode on A1As [which was a three-axle truck with the center axle unpowered] and carried a noticeably longer carbody). And a swift end it was. Within twenty years of the EMC’s debut of the EA, the first in the E series, steam would all but be silenced across the rail industry’s major Class I railroads. While for many years locomotive manufacturers, particularly the American Locomotive Company (Alco) and EMC, had been building switcher locomotives to be used in yard work or “backcountry” branch lines hauling local freight trains, a true road unit had never been developed until the EA in 1937. The EA (E, which stood for eighteen hundred horsepower) carried two 900-horsepower, 12-cylinder 201-A Winton engines and the first buyers of these test models were the Baltimore & Ohio and Atchison, Topeka & Santa Fe railroads (while mechanically the same the AT&SF's units were classified as E1s). 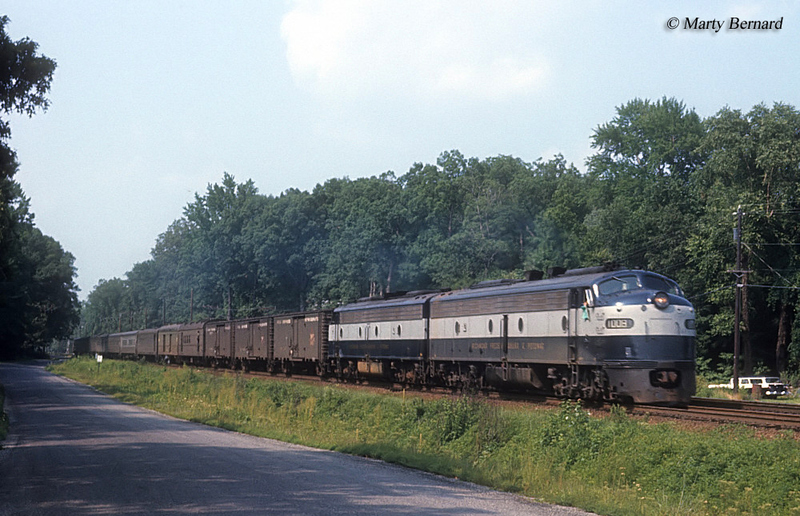 It did not take long after the EA's debut for the industry to realize the success of these new locomotives, especially with how well the EMD’s F series proved itself and the economies it provided (particularly coupled with the earlier streamlined trainsets, such as the Burlington Railroad’s Zephyr 9900). However, with the onset of World War II and diesel-electric construction being restricted during wartime, there were not many Es purchased until after the war ended in 1945. 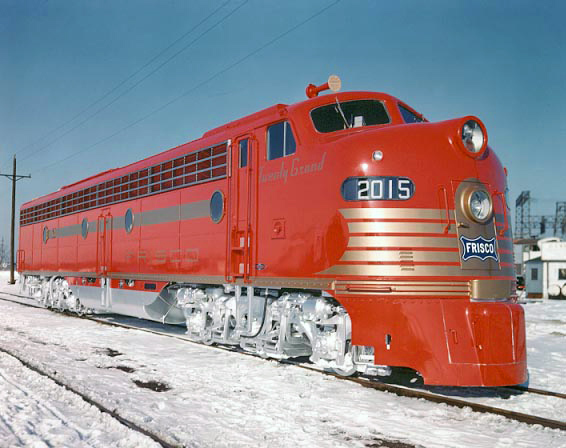 After 1945, however, EMC, by now known as General Motors’ Electro-Motive Division (EMD), began once again producing diesel-electrics and restyled its latest E model, the E7, with a nose much more sharply slanted to give it a “bulldog” look that much more resembled the later F series, and increased its horsepower from 1,800 to 2,000. The units also employed trucks of the A1A type, meaning that the two outside axles were powered with the middle was non-powered. Future EMD E series models were essentially the same from an aesthetic standpoint with minor changes made to locomotive’s car-body. Following the E7 was the 1949 E8, which produced 2,250 horsepower, and later in 1954 the final model, the E9, which produced 2,400 horsepower. 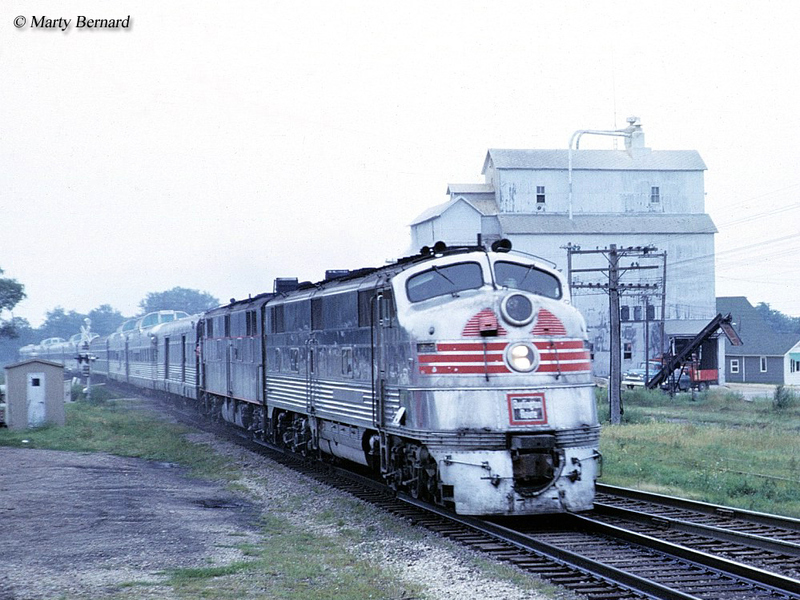 Totaled together the entire series did not sell as well as perhaps the later GP series but for a locomotive built specifically for passenger use it did very well totaling over 1,300 units. 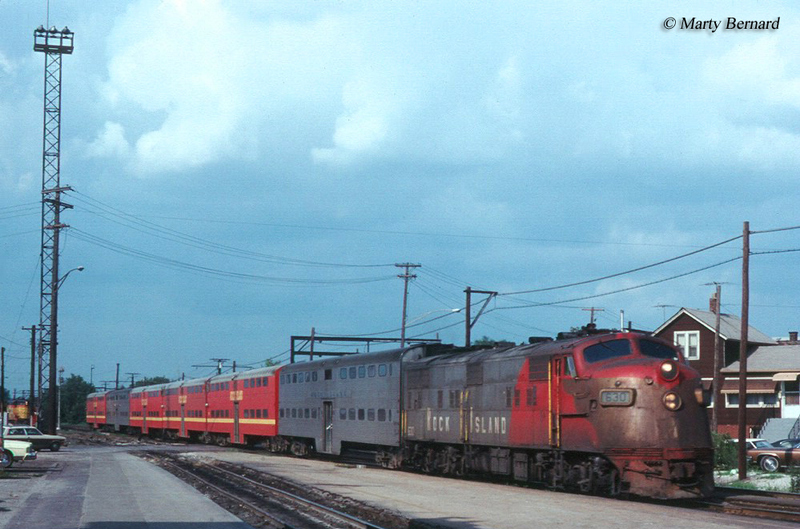 Likewise the EMD E series had matching streamlined cabless booster units, known as Bs (the B designation referred to cabless units with A designations meaning cab units) to increase horsepower (for instance, E8B, E7B, etc.). Today there are several units of the EMD E series still surviving, mostly notably the E8s and E9s, some of which still even operate on commuter or freight railroads although few of the E7 models, and earlier, are still around as all are relegated to museums. Thankfully, one of the original Es does survive, B&O EA #51. Today the unit is cosmetically restored into its original condition as delivered from EMC in 1937, at the Baltimore & Ohio Railroad Museum in Baltimore, Maryland.